Brentford will find out on Thursday evening whether their planning application for a new stadium at Lionel Road has been successful. Hounslow Council planning officers have recommended approving the scheme, subject to referral to the Mayor of London and the Secretary of State. The Bees submitted a proposal for a 20,000-seater stadium and up to 910 residential apartments in May. The council's planning committee will meet on Thursday, 18:30 GMT to decide. The Bees bought the 7.6 acre Lionel Road site, which lies between Kew Bridge railway station and the M4 motorway, last year. Matthew Benham, the League One club's owner, has agreed to underwrite a funding gap in order for the scheme to go ahead. 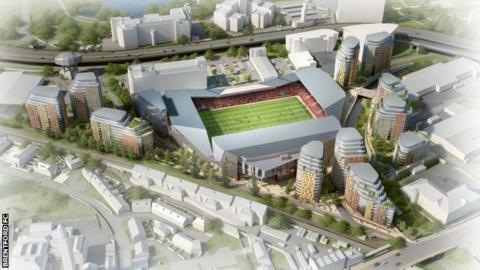 The Lionel Road site was first identified as a prospective location for a new ground in 2002 and Brentford hope to move in for the start of the 2016-17 season. Brentford, who have played their home games at the 12,763-capacity Griffin Park since 1904, had an average league attendance of 6,302 last season. Chief executive Mark Devlin has said the Bees must attract new supporters to make the move a success. Brentford supporters have written letters and postcards to the council in support of the application, but objections have been voiced by several parties, including local residents and the Royal Botanic Gardens at Kew.